Poeltl is also out, further depleting the Spurs' frontcourtt for Saturday's game against Rockets. TV: KENS 5, 7 p.m. Rockets' injury/inactive report: Forward Carmelo Anthony (illness), out; guard Eric Gordon (right abductor strain), questionable; center Nene Hilario (right calf strain), out; point guard Brandon Knight (knee), out; point guard Michael Carter-Williams (illness), questionable. Spurs' injury/inactive report: Forward/center Pau Gasol (left foot soreness), out; forward Rudy Gay (right heel soreness), out; center Jakob Poeltl (sprained right ankle), out; guard Lonnie Walker IV (right medial meniscus), out; guard Dejounte Murray (right ACL), out. Notable: Although the Spurs lost to Miami in their last game, they are the first team to hold the Heat to under 100 points this season . . . In only 10 games as a Spur, DeMar DeRozan already has set career highs in assists and rebounds. DeRozan has played 685 games since he made his NBA debut on Oct. 28, 2009. He is a two-time All-NBA pick and four-time All-Star . . . The Silver and Black play three consecutive road games after facing Houston on Saturday. They play at Sacramento on Monday, Phoenix on Wednesday and the Clippers in Los Angeles on Thursday. The Spurs' next home game after Saturday will be against defending champion Golden State on Sunday, Nov. 18. 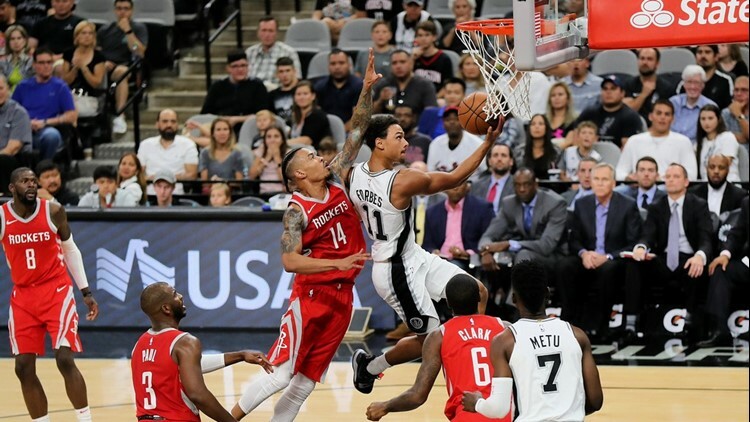 SAN ANTONIO – With both teams coming off losses, the Houston Rockets and Spurs don't figure to be in a good mood when they square off Saturday night at the AT&T Center. The Rockets (4-6) are coming off a double-digit road loss to the Oklahoma City Thunder on Thursday, and the Silver and Black (6-4) have been stewing since losing their second straight game Wednesday in Miami. Saturday's game will be broadcast by KENS 5, the official TV station of the Spurs. Saturday night’s pregame show on KENS 5 starts at 7. Center Pau Gasol (left foot soreness) and forward Rudy Gay (right heel soreness) were ruled out Friday, and the Spurs announced Saturday afternoon that center Jakob Poeltl (sprained right ankle) also won't play against the Rockets. The Spurs trailed the Heat by 19 in the fourth quarter before rallying, but it was too little, too late. Coach Gregg Popovich called out his players after the 95-88 loss in Miami, saying they were "soft, undisciplined and lacking in commitment." "We want to forget about those two games," backup guard Marco Belinelli said after Saturday morning's shootaround. "Tonight's game is going to be important for us. We're going to play at home in front of our fans. We're going to try to be aggressive from the beginning of the game." The Silver and Black trailed Orlando by 26 points with 9:02 left last Sunday, but they went on a 29-8 run to close the gap to five with 1:41 remaining. The Magic dug in and held on for a 117-110 victory. "I think we should play twice as good if we lost the last two games," backup forward Davis Bertans said. "We've just to be aggressive on both ends, and I think that's going to be it. It's going to be more about who's the more aggressive team than who's playing a better game overall strategy-wise. It's more about the energy." Bertans agreed with Popovich's assessment that the Spurs weren't physical enough against the Heat on Wednesday night. "I think we didn't do a great job on defense the first half, and also the second half," Bertans said. "Rebounding wasn't there. Those are the things that you can lose games by just not getting the boards. "It''s all those little things. It starts with the rebounding. On those 50-50 balls, just give yourself an extra chance to win the game if something else isn't going right." The Silver and Black struggled mightily on offense, shooting only 33 percent. That's their worst shooting performance in a regular-season game since 2008. The Spurs nailed 13 of 32 three-pointers, but connected on only 29 percent of their two-point tries. Forward LaMarcus Aldridge scored only six points on 2-of-14 shooting, and DeMar DeRozan finished with 18 points. Patty Mills led the Spurs' scoring with 22 points, but he made only 8 of 22 field-goal attempts. Bertans finished with a season-high 19 points. Aldridge and DeRozan had 16 and 14 rebounds, respectively. That's a career high for DeRozan. "At the beginning of the game we need to start aggressive," Belinelli said. "In the last couple of games we didn't do that. I think that's one of the reasons why we lost the last couple of games. I think tonight we need to be focused, be mentally ready, tough, and be ready to compete from the beginning of the game." After facing Houston on Saturday, the Spurs play eight of their next 10 games and 10 of their next 13 on the road. They start a three-game road trip at Sacramento on Monday. San Antonio's next home game after Saturday will be against defending champion Golden State on Sunday, Nov. 18. "We definitely need a good game (against the Rockets) just to start off that crazy schedule at the end of November,," Bertans said. "It's a real important game, especially because it's Houston, which everybody knows it's always an important game.